The Catamounts are coming off an impressive 5-2 win over pre-season #4 Michigan in Ann Arbor last weekend despite being out shot 50-24. Four different Catamounts scored goals and three players had multi point games to get Vermont off on the right foot. Quinnipiac had its final tune-up last weekend with a 5-2 exhibition win over the University of Prince Edward Island. With the dress rehearsal in the books, its now time to take to the stage of the 2018-2019 season. Vermont lost its top scorer from a season ago when Ross Colton gave up the final two seasons of his college eligibility to turn pro. A team that scored just 79 goals last season has to replace the 16 goals along with 8 on the power play that Colton provided. Our friends over at the UVM Hockey Blog believe it will have to be a collective effort in order to replace Colton as discussed in our Q&A. The top line of Coughlin, Esposito and Alvaro all recorded points on the first two goals against Michigan. That will be the line to watch. Vermont doesn't look like it has a ton of offensive depth but its still early in the season. Former Quinnipiac commit John DeRoche is a freshman on this Catamount team. Bryce Misley and Liam Coughlin are the lone draft picks at forward. Despite a win last week over Michigan, the Vermont defense might be one of the teams weaknesses according to the UVM Hockey Blog. Its a defense that features no seniors on the blue line. Junior captain Matt O'Donnell and fellow junior Jake Massie provide the veteran experience on the blue line but the majority of the players are sophomores and freshman. They gave up a lot of shots and shot attempts in the Michigan game and that can't continue for Vermont if they want to have success. Massie is the lone draft pick on the blue line for Vermont. Junior goaltender Stefanos Lekkas is between the pipes as the starter for the third consecutive season. He has won 29 games in two seasons plus one game this season during his time with Vermont. While not overly big he is a steady presence in between the pipes and capable of playing at a high level for Vermont. 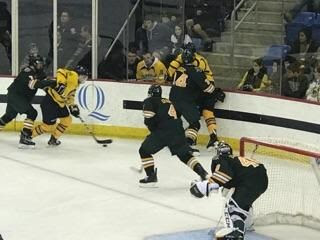 Lekkas has two career games played against Quinnipiac winning in Belfast Friendship Four championship two years ago before losing to the Bobcats in overtime in Hamden a season ago. Coming off the programs first losing season in 22 years it is important for Quinnipiac with 12 new freshman on this roster to get off to a good start and build momentum for the 2018-2019 campaign. Quinnipiac will need its young players to step up and the veterans to have better seasons in the past if it wants to return to the heights of the teams between 2013-2016.